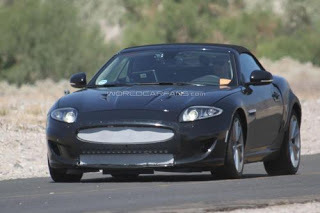 Here are the latest spy shots of a Jaguar XE mule doing some hot-weather testing in Death Valley, USA. Noticeable here is the new centrally-mounted twin exhaust of this test mule, which seems extraneous to the double pipes at each end of the rear fascia – the mark of the current XK set-up upon which this mule is based. The EX mule here is riding on a shortened XK chassis and body. We also see some changes to the interior in the single photo of the cabin. The 2013 XE will be a two-seater sold as both a coupe and cabriolet and will compete against the likes of the Porsche Cayman and 911 models. We expect a V6 in at least two guises, naturally-aspirated and supercharged. More details are sure to follow later in the year.